Could this be the most “ruggedness” a crossover based on a car platform can bring? 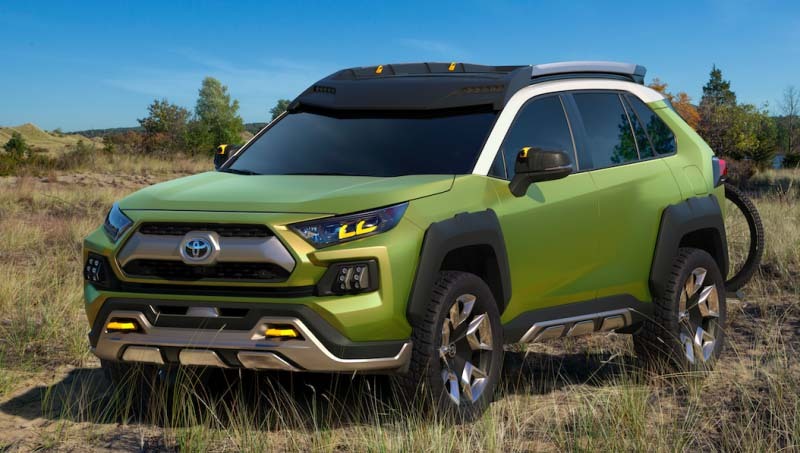 Called the Toyota FT-AC Concept, this particular car represents a tackier and more exciting future of Toyota crossovers and SUVs which are about to become a whole lot more fun and a whole lot less dull. Revealed at the 2017 Los Angeles Auto Show, the Toyota FT-AC Concept actually gives us a unique look into what the RAV4 may become in some of its versions. Furthermore, it may actually show us what a new “larger-than-RAV4-but-smaller-than-4Runner” crossover might look like. That is a stretch, of course. The Toyota FT-AC Concept takes all off-road centered hardware imaginable and stuffs it into the crossover-looking body. Toyota painted it in this dashing shade of green, added bumper protection, massive skid plates, additional LED lights on top of the front and for the back, bike rack and what not. Honestly, it all looks quite nice, even fine. I could see myself driving it somewhere, but the question remains, how far could I go?